Crimean–Congo hemorrhagic fever (CCHF) is a viral disease. Symptoms of CCHF may include fever, muscle pains, headache, vomiting, diarrhea, and bleeding into the skin. Onset of symptoms is less than two weeks following exposure. Complications may include liver failure. In those who survive, recovery generally occurs around two weeks after onset. The CCHF virus is typically spread by tick bites or contact with livestock carrying the disease. Those affected are often farmers or work in slaughterhouses. The virus can also spread between people via body fluids. Diagnosis is by detecting antibodies, the virus's RNA, or the virus itself. It is a type of viral hemorrhagic fever. Prevention involves avoiding tick bites. A vaccine is not commercially available. Treatment is typically with supportive care. The medication ribavirin may also help. It occurs in Africa, the Balkans, the Middle East, and Asia. Often it occurs in outbreaks. In 2013 Iran, Russia, Turkey, and Uzbekistan documented more than fifty cases. The risk of death among those affected is between 10 and 40%. It was first detected in the 1940s. The illness in humans is a severe form of hemorrhagic fever. Typically, after a 1–3 day incubation period following a tick bite or 5–6 days after exposure to infected blood or tissues, flu-like symptoms appear, which may resolve after one week. In up to 75% of cases, signs of bleeding can appear within 3–5 days of the onset of illness in case of bad containment of the first symptoms: mood instability, agitation, mental confusion and throat petechiae; and soon after nosebleeds, vomiting, and black stools. The liver becomes swollen and painful. Disseminated intravascular coagulation may occur, as well as acute kidney failure, shock, and sometimes acute respiratory distress syndrome. People usually begin to recover after 9–10 days first symptoms appeared. Up to 30% of infected people die by the end of the second week of illness. The Crimean-Congo hemorrhagic fever orthonairovirus (CCHFV) is a member of the genus Orthonairovirus, family Nairoviridae of RNA viruses. The virons are 80–120 nanometers (nm) in diameter and are pleomorphic. There are no host ribosomes within the viron. Each virion contains three copies of the genome. The envelope is single layered and is formed from a lipid bilayer 5 nm thick. It has no protrusions. The envelope proteins form small projections ~5–10 nm long. The nucleocapsids are filamentous and circular with a length of 200–3000 nm. The virus might enter a cell using the cell surface protein nucleolin. The genome is circular, negative sense RNA in three parts – Small (S), Medium (M) and Large (L). The L segment is 11–14.4 kilobases in length while the M and S segments are 4.4–6.3 and 1.7–2.1 kilobases long respectively. The L segment encodes the RNA polymerase, the M segment encodes the envelope glycoproteins (Gc and Gn), and the S segment encodes the nucleocapsid protein. The mutation rates for the three parts of the genome were estimated to be: 1.09×10−4, 1.52×10−4 and 0.58×10−4 substitutions/site/year for the S, M, and L segments respectively. CCHFV is the most genetically diverse of the arboviruses: Its nucleotide sequences frequently differ between different strains, ranging from a 20% variability for the viral S segment to 31% for the M segment. Viruses with diverse sequences can be found within the same geographic area; closely related viruses have been isolated from widely separated regions, suggesting that viral dispersion has occurred possibly by ticks carried on migratory birds or through international livestock trade. Reassortment among genome segments during coinfection of ticks or vertebrates seems likely to have played a role in generating diversity in this virus. Based on the sequence data, seven genotypes of CCHFV have been recognised: Africa 1 (Senegal), Africa 2 (Democratic Republic of the Congo and South Africa), Africa 3 (southern and western Africa), Europe 1 (Albania, Bulgaria, Kosovo, Russia and Turkey), Europe 2 (Greece), Asia 1 (the Middle East, Iran and Pakistan) and Asia 2 (China, Kazakhstan, Tajikistan and Uzbekistan). Ticks are both "environmental reservoir" and vector for the virus, carrying it from wild animals to domestic animals and humans. Tick species identified as infected with the virus include Argas reflexus, Hyalomma anatolicum, Hyalomma detritum, Hyalomma marginatum marginatum and Rhipicephalus sanguineus. At least 31 different species of ticks from the genera Haemaphysalis and Hyalomma in southeastern Iran have been found to carry the virus. Wild animals and small mammals, particularly European hare, Middle-African hedgehogs and multimammate rats are the "amplifying hosts" of the virus. Birds are generally resistant to CCHF, with the exception of ostriches. Domestic animals like sheep, goats and cattle can develop high titers of virus in their blood, but tend not to fall ill. 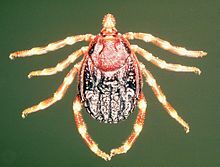 The "sporadic infection" of humans is usually caused by a Hyalomma tick bite. Animals can transmit the virus to humans, but this would usually be as part of a disease cluster. When clusters of illness occur, it is typically after people treat, butcher or eat infected livestock, particularly ruminants and ostriches. Outbreaks have occurred in abattoirs and other places where workers have been exposed to infected human or animal blood and fomites Humans can infect humans and outbreaks also occur in clinical facilities through infected blood and unclean medical instruments. Where mammalian tick infection is common, agricultural regulations require de-ticking farm animals before transportation or delivery for slaughter. Personal tick avoidance measures are recommended, such as use of insect repellents, adequate clothing, and body inspection for adherent ticks. Since the 1970s, several vaccine trials around the world against CCHF have been terminated due to high toxicity. As of March 2011[update], the only available and probably somewhat efficacious CCHF vaccine has been an inactivated antigen preparation then used in Bulgaria. No publication in the scientific literature related to this vaccine exists, which a Turkish virologist called suspicious both because antiquated technology and mouse brain were used to manufacture it. More vaccines are under development, but the sporadic nature of the disease, even in endemic countries, suggests that large trials of vaccine efficacy will be difficult to perform. Finding volunteers may prove challenging, given growing anti-vaccination sentiment and resistance of populations to vaccination against contagious diseases. The number of people to be vaccinated, and the length of time they would have to be followed to confirm protection would have to be carefully defined. Alternatively, many scientists appear to believe that treatment of CCHF with ribavirin is more practical than prevention, but some recently conducted clinical trials appear to counter assumptions of drug efficacy. In 2011, a Turkish research team led by Erciyes University successfully developed the first non-toxic preventive vaccine, which passed clinical trials. As of 2012, the vaccine was pending approval by the US FDA. Since the Ebola epidemic, the WHO jumpstarted a "Blueprint for Research and Development preparedness" on emerging pathogens with epidemic potential, against which there are no medical treatments. CCHF was the top priority on the initial list from December 2015, and is second as of January 2017. Treatment is mostly supportive. Ribavirin is effective in vitro and has been used by mouth during outbreaks, but there is no trial evidence to support its use. As of 2011[update] the use of Immunoglobulin preparations has remained unproven and antibody engineering, which raised hopes for monoclonal antibody therapy, has remained in its infancy. CCHD occurs most frequently among agricultural workers, following the bite of an infected tick, and to a lesser extent among slaughterhouse workers exposed to the blood and tissues of infected livestock, and medical personnel through contact with the body fluids of infected persons. As of 2013[update] the northern limit of CCHF has been 50 degrees northern latitude, north of which the Hyalomma ticks have not been found. Per a WHO map from 2008, Hyalomma ticks occurred south of this latitude across all of the Eurasian continent and Africa, sparing only the islands of Sri Lanka, Indonesia and Japan. Serological or virological evidence of CCHF was widespread in Asia, Eastern Europe, the Middle East (except Israel, Lebanon and Jordan), central Africa, Western Africa, South Africa and Madagascar. In 2008, more than 50 cases/year were reported from only 4 countries: Turkey, Iran, Russia and Uzbekistan. 5-49 cases/year were present in South Africa, Central Asia including Pakistan and Afghanistan (but sparing Turkmenistan), in the Middle East only the UAE and the Balkan countries limited to Romania, Bulgaria, Serbia, Montenegro and Kosovo-Albania. A 2014 map by the CDC shows endemic areas (in red) largely unchanged in Africa and the Middle East, but different for the Balkan, including all countries of the former Yugoslavia, and also Greece, but no longer Romania. India´s Northwestern regions of Rajastan and Gujarat saw their first cases. From 1995 to 2013, 228 cases of CCHF were reported in the Republic of Kosovo, with a case-fatality rate of 25.5%. In September 2010, an outbreak was reported in Pakistan's Khyber Pakhtunkhwa province. Poor diagnosis and record keeping caused the extent of the outbreak to be uncertain, though some reports indicated over 100 cases, with a case-fatality rate above 10%. In January 2011, the first human cases of CCHF in India was reported in Sanand, Gujarat, India, with 4 reported deaths, which included the index patient, treating physician and nurse. As of May 2012[update], 71 people were reported to have contracted the disease in Iran, resulting in 8 fatalities. In October 2012, a British man died from the disease at the Royal Free Hospital in London. He had earlier been admitted to Gartnavel General Hospital in Glasgow, after returning on a flight from Kabul in Afghanistan. In July 2013, seven persons died due to CCHF in Kariyana village in Babra taluka, Amreli district, Gujarat, India. In August 2013, a farmer from Agago, Uganda was treated at Kalongo Hospital for a confirmed CCHF infection. The deaths of three other individuals in the northern region were suspected to have been caused by the virus. Another unrelated CCHF patient was admitted to Mulago Hospital on the same day. The Ministry of Health announced on the 19th that the outbreak was under control, but the second patient, a 27-year-old woman from Nansana, died on the 21st. She is believed to have contracted the virus from her husband, who returned to Kampala after being treated for CCHF in Juba, South Sudan. In June 2014, cases were diagnosed in Kazakhstan. Ten people, including an ambulance crew, were admitted on to hospital in southern Kazakhstan with suspected CCHF. In July 2014 an 8th person was found to be infected with CCHF at Hayatabad Medical Complex (HMC), Pakistan. The eight patients, including a nurse and 6 Afghan nationals, died between April and July 2014. As of 2015[update], sporadic confirmed cases have been reported from Bhuj, Amreli, Sanand, Idar and Vadnagar in Gujarat, India. In November 2014, a doctor and a labourer in north Gujarat tested positive for the disease. In the following weeks, three more people died from CCHF. In March 2015, one more person died of CCHF in Gujarat. As of 2015, among livestock, CCHF was recognized as "widespread" in India, only 4 years after the first human case had been diagnosed. In August 2016, the first local case of CCHF in Western Europe occurred in Western Spain. A 62-year-old man, who had been bitten by a tick in Spain died on August 25, having infected a nurse. The tick bite occurred in the province of Ávila, 300 km away from the province of Cáceres, where CCHF viral RNA from ticks was amplified in 2010. As of July 2017[update] it was unclear what specific ecology led to the Spanish cases. In August 2016, a number of Pakistani news sources raised concerns regarding the disease. Between January and October 2016, CCHF outbreaks in Pakistan were reported with highest numbers of cases and deaths during August 2016, just before the festival of Eid-al-Adha (held on September 13–15 in 2016). It was hypothesized that the festival could play an important part as people could come into contact with domestic or imported animals potentially infected with CCHF virus. The Pakistani NIH showed there was no correlation, and that CCHF cases have coincided with the peak tick proliferation during the preceding 8–10 years. The virus may have evolved around 1500–1100 BC. It is thought that changing climate and agricultural practices near this time could be behind its evolution. In the 12th century a case of a hemorrhagic disease reported from what is now Tajikistan may have been the first known case of Crimean–Congo hemorrhagic fever. During the Crimean War, the disease was known as "Crimean fever" and contracted by many, including Florence Nightingale. In 1944, Soviet scientists first identified the disease they called Crimean hemorrhagic fever in Crimea They established its viral etiology, but were unable to isolate the agent at that time. In February 1967, virologists Jack Woodall, David Simpson, Ghislaine Courtois and others published initial reports on a virus they called the Congo virus. In 1956, the Congo virus had first been isolated by physician Ghislaine Courtois, head of the Provincial Medical Laboratory, Stanleyville, in the Belgian Congo. Strain V3010, isolated by Courtois, was sent to the Rockefeller Foundation Virus Laboratory (RFVL) in New York City and found to be identical to another strain from Uganda, but to no other named virus at that time. In June 1967, Soviet virologist Mikhail Chumakov registered an isolate from a fatal case that occurred in Samarkand in the Catalogue of Arthropod-borne Viruses. In 1969, the Russian strain, which Chumakov had sent to the RFVL, was published to be identical to the Congo virus. The International Committee on Taxonomy of Viruses proposed the name Congo–Crimean hemorrhagic fever virus, but the Soviets insisted on Crimean–Congo hemorrhagic fever virus. In 1973, against all principles of scientific nomenclature based on priority of publication, it was adopted as the official name, in possibly the first instance of a virus losing its name to politics and the Cold War. Since then, Congo–Crimean or just Congo virus has been used in many reports, which would be missed in searches of medical databases using the official name. These reports include records of the occurrence of the virus or antibodies to the virus from Greece, Portugal, South Africa, Madagascar (the first isolation from there), the Maghreb, Dubai, Saudi Arabia, Kuwait and Iraq. ^ a b c d e f g h i j k l m n o p q r s t u v w x "Crimean-Congo haemorrhagic fever". World Health Organization. January 2013. Archived from the original on 13 July 2017. Retrieved 18 July 2017. ^ a b Inc, GIDEON Informatics; Berger, Dr Stephen (2017). Crimean-Congo Hemorrhagic Fever: Global Status: 2017 edition. GIDEON Informatics Inc. p. 7. ISBN 9781498815567. Archived from the original on 2017-09-10. ^ "Ebola virus infection - Differentials | BMJ Best Practice". bestpractice.bmj.com. Retrieved 21 May 2018. ^ Magill, Alan J. (2013). Hunter's Tropical Medicine and Emerging Infectious Disease, Expert Consult - Online and Print,9: Hunter's Tropical Medicine and Emerging Infectious Disease. Elsevier Health Sciences. p. 334. ISBN 978-1416043904. Archived from the original on 2017-08-04. ^ a b "Crimean-Congo haemorrhagic fever, Fact sheet N°208". WHO. January 2013. Archived from the original on 2015-05-20. Retrieved 2015-05-19. ^ a b Carter, Stephen D.; Surtees, Rebecca; Walter, Cheryl T.; et al. (2012-10-15). "Structure, Function, and Evolution of the Crimean-Congo Hemorrhagic Fever Virus Nucleocapsid Protein". Journal of Virology. 86 (20): 10914–10923. doi:10.1128/JVI.01555-12. ISSN 0022-538X. PMC 3457148. PMID 22875964. ^ Xiao, X.; Feng, Y.; Zhu, Z.; Dimitrov, D. S. (2011). "Identification of a putative Crimean–Congo hemorrhagic fever virus entry factor". Biochem. Biophys. Res. Commun. 411 (2): 253–258. doi:10.1016/j.bbrc.2011.06.109. PMC 3155881. PMID 21723257. ^ a b Carroll SA, Bird BH, Rollin PE, Nichol ST (2010). "Ancient common ancestry of Crimean-Congo hemorrhagic fever virus". Mol Phylogenet Evol. 55 (3): 1103–1110. doi:10.1016/j.ympev.2010.01.006. PMID 20074652. ^ a b Bente, Dennis A.; Forrester, Naomi L.; Watts, Douglas M.; McAuley, Alexander J.; Whitehouse, Chris A.; Bray, Mike (October 2013). "Crimean-Congo hemorrhagic fever: History, epidemiology, pathogenesis, clinical syndrome and genetic diversity". Antiviral Research. 100 (1): 159–189. doi:10.1016/j.antiviral.2013.07.006. PMID 23906741. ^ Mehravaran, Ahmad; Moradi, Maryam; Telmadarraiy, Zakyeh; Mostafavi, Ehsan; Moradi, Ali Reza; Khakifirouz, Sahar; Shah-Hosseini, Nariman; Varaie, Fereshteh Sadat Rasi; Jalali, Tahmineh; Hekmat, Soheila; Ghiasi, Seyed Mojtaba; Chinikar, Sadegh (February 2013). "Molecular detection of Crimean-Congo haemorrhagic fever (CCHF) virus in ticks from southeastern Iran". Ticks and Tick-borne Diseases. 4 (1–2): 35–38. doi:10.1016/j.ttbdis.2012.06.006. PMID 23238248. ^ Ergönül Ö, Celikbas A, Dokuzoguz B, et al. (2004). "The characteristics of Crimean–Congo hemorrhagic fever in a recent outbreak in Turkey and the impact of oral ribavirin therapy". Clin Infect Dis. 39 (2): 285–9. doi:10.1086/422000. PMID 15307042. ^ Division of High-Consequence Pathogens and Pathology, Viral Special Pathogens Branch (March 5, 2014). "Crimean-Congo Hemorrhagic Fever (CCHF) Transmission". CDC. ^ a b c d Keshtkar-Jahromi M, Kuhn JH, Christova I, Bradfute SB, Jahrling PB, Bavari S (March 2011). "Crimean-Congo hemorrhagic fever: Current and future prospects of vaccines and therapies". Antiviral Res. 90 (2): 85–92. doi:10.1016/j.antiviral.2011.02.010. PMID 21362441. ^ a b sitesi, milliyet.com.tr Türkiye'nin lider haber. "Keneye aşı müjdesi". Archived from the original on 2013-12-19. ^ Kieny, Marie-Paule (20 May 2015). "After Ebola, a Blueprint Emerges to Jump-Start R&D". Scientific American Blog Network. Archived from the original on 20 December 2016. Retrieved 13 December 2016. ^ "R&D Blueprint. List of Blueprint priority diseases". World Health Organization. January 2017. Archived from the original on 10 September 2017. Retrieved 13 July 2017. ^ Watts DM, Ussery MA, Nash D, Peters CJ (1989). "Inhibition of Crimean–Congo hemorrhagic fever viral infectivity yields in vitro by ribavirin". Am J Trop Med Hyg. 41 (5): 581–5. doi:10.4269/ajtmh.1989.41.581. PMID 2510529. ^ a b c "Geographic distribution of Crimean-Congo haemorrhagic fever (CCHF)". WHO. 2008. Archived from the original on 2016-05-13. ^ Division of High-Consequence Pathogens and Pathology, Viral Special Pathogens Branch (March 5, 2014). "Crimean-Congo Hemorrhagic Fever (CCHF) Distribution Map". CDC. Archived from the original on June 18, 2017. ^ Fajs L, Jakupi Xh Ahmeti S, Humolli I, Dedushaj I, Avšič-Županc T (2014). "Molecular Epidemiology of Crimean-Congo Hemorrhagic Fever Virus in Kosovo". PLoS Negl Trop Dis. 8 (1): e2647. doi:10.1371/journal.pntd.0002647. PMC 3886908. PMID 24416468. ^ "Congo Fever: Patient dies in hospital". BBC News. 6 October 2012. Archived from the original on 7 October 2012 – via www.bbc.co.uk. ^ indiatvnews (2013-07-15). "Congo Fever: Seven Die In Amreli In A Week Mobile Site". IndiaTv. Archived from the original on 2016-03-04. Retrieved 2015-03-28. ^ "Congo fever confirmed in Amreli village". Times of India. ^ Biryabarema, Elias (17 August 2013). "Three die in Uganda from Ebola-like fever: Health Ministry". Yahoo News. Reuters. Archived from the original on 20 August 2013. Retrieved 16 August 2013. ^ Otto, Alex (22 August 2013). "High Alert Over Crimean Fever". The Observer. Kampala. Archived from the original on 14 July 2014. Retrieved 26 August 2013. ^ Khan, Hidayat (2014-07-11). "Stemming outbreaks: Eighth patient dies of Congo hemorrhagic fever at HMC". Archived from the original on 13 July 2014. Retrieved 13 July 2014. ^ "Health officials confirm congo fever death of Jaisalmer man". The Times of India Mobile Site. 26 January 2015. Archived from the original on 2 April 2015. Retrieved 30 March 2015. ^ "Kutch resident dies of Confo fever". The Indian Express. March 29, 2015. Archived from the original on April 3, 2015. Retrieved March 29, 2015. ^ "Crimean-Congo hemorrhagic fever spreads across India - Outbreak News Today". 9 October 2015. Archived from the original on 20 December 2015. ^ "First Local Case of Tick-Borne Disease Kills Man in Spain". Scientif American. n.d. Archived from the original on 2016-09-02. Retrieved 2016-09-03. ^ Negredo, Anabel; de la Calle-Prieto, Fernando; Palencia-Herrejón, Eduardo; et al. (2017-07-13). "Autochthonous Crimean–Congo Hemorrhagic Fever in Spain". New England Journal of Medicine. 377 (2): 154–161. doi:10.1056/NEJMoa1615162. ISSN 0028-4793. PMID 28700843. ^ Spengler, Jessica R.; Bente, Dennis A. (13 July 2017). "Crimean–Congo Hemorrhagic Fever in Spain—New Arrival or Silent Resident?". New England Journal of Medicine. 377 (2): 106–108. doi:10.1056/NEJMp1707436. PMC 5922251. PMID 28700846. ^ "Congo virus: Doctors warn against outbreak of disease". The Express Tribune. 17 August 2016. Archived from the original on 6 September 2016. ^ "Karachi: Congo virus claims another life - Pakistan - Dunya News". Archived from the original on 2016-09-04. ^ Karim, Asad M.; Hussain, Irfan; Lee, J. H.; et al. (2017). "Surveillance of Crimean-Congo haemorrhagic fever in Pakistan". Lancet Infect. Dis. 17 (4): 367–368. doi:10.1016/S1473-3099(17)30119-6. PMID 28346174. ^ Alam, MM; Khurshid, A; Rana, MS; Aamir, UB; Salman, M; Ahmad, M (August 2017). "Surveillance of Crimean-Congo haemorrhagic fever in Pakistan". The Lancet. Infectious Diseases. 17 (8): 806. doi:10.1016/S1473-3099(17)30403-6. PMID 28741546. ^ "Природная очаговость зоонозных инфекций в Крыму". Мир Животных. Archived from the original on 2016-09-23. ^ Simpson DI, Knight EM, Courtois G, et al. (February 1967). "Congo virus: a hitherto undescribed virus occurring in Africa. I. Human isolations—clinical notes". East Afr Med J. 44 (2): 86–92. PMID 6040759. ^ Woodall JP, Williams MC, Simpson DI (February 1967). "Congo virus: a hitherto undescribed virus occurring in Africa. II. Identification studies". East Afr Med J. 44 (2): 93–8. PMID 6068614. ^ Chumakov MP; Butenko AM; Shalunova NV; et al. (May–June 1968). "New data on the viral agent of Crimean hemorrhagic fever". Vopr Virusol (in Russian). 13 (3): 377. PMID 4235803. ^ Casals J (May 1969). "Antigenic similarity between the virus causing Crimean hemorrhagic fever and Congo virus". Proc Soc Exp Biol Med. 131 (1): 233–6. doi:10.3181/00379727-131-33847. PMID 5770109. ^ Crowcroft NS, Morgan D, Brown D (March 2002). "Viral haemorrhagic fevers in Europe—effective control requires a co-ordinated response". Euro Surveill. 7 (3): 31–2. doi:10.2807/esm.07.03.00343-en. PMID 12631941. ^ Al-Tikriti SK, Al-Ani F, Jurji FJ, et al. (1981). "Congo/Crimean haemorrhagic fever in Iraq". Bull World Health Organ. 59 (1): 85–90. PMC 2396030. PMID 6790183. ^ Okorie TG (March 1991). "Comparative studies on the vector capacity of the different stages of Amblyomma variegatum Fabricius and Hyalomma rufipes Koch for Congo virus, after intracoelomic inoculation". Vet Parasitol. 38 (2–3): 215–23. doi:10.1016/0304-4017(91)90131-e. PMID 1907050. Ergönül O. (2006). "Crimean–Congo haemorrhagic fever". Lancet Infect Dis. 6 (4): 203–214. doi:10.1016/S1473-3099(06)70435-2. PMID 16554245.